What are current trends in Applied Graph Theory? I am interested mainly in non-algorithmical problems. Maybe even in applications of graphs to other mathematical disciplines. For example, abstract algebra naturally produces the notion of non-commuting graph of a group and prime graph of a ring. Also, what about modern Chemical Graph Theory? Is it still bounded by finding upper and lower bounds on graph indexes like Wiener's, Zagreb's, Randic's and other? 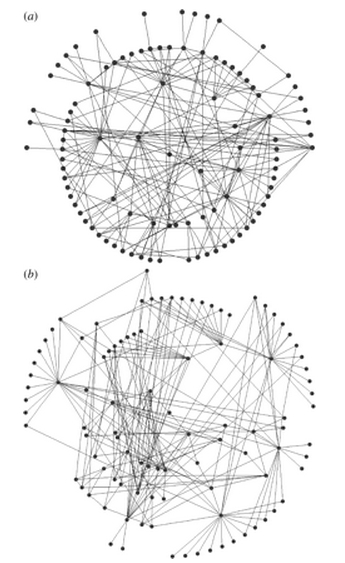 Finally, what graph-theoretical problems arose say from biological networks or from the study of social graphs? Clearly I am not specific on this question. Sorry for that! However, I have strong interest in graphs applications, so I had to ask mathoverflowers something like that! Also, thanks for your answers! I am not working in the field of applied graph theory, so my knowledge of current trends is limited. But an active object of research seems to be the webgraph. This is the directed graph with nodes being the websites and edges being the links between websites. Anthony Bonato wrote a book on the subject called "A course on the web graph". It appeared in 2008 as an AMS book. A preview can be found here. Not the answer you're looking for? Browse other questions tagged graph-theory soft-question applied-mathematics or ask your own question. Why is “P vs. NP” necessarily relevant? When does a `distinguished matching' exist? What non-categorical applications are there of homotopical algebra?